Often children of high level athletes have all the pressure and eyes on them. Do they live up to their father or mothers hype? At a young age it is hard to project a kid’s future in the sport. As of today, Ramel Lloyd Jr. is in the right path. 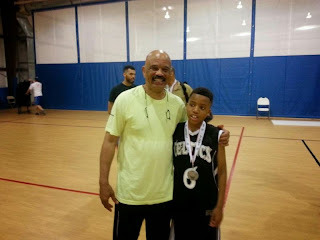 The 5'5 PG out of the 2022 class is son of New York legend Ramel "Rock" Lloyd who played at Syracuse under Jim Boeheim. Los Angeles native Ramel Lloyd Jr. is a long point guard with a tremendous ability to pass the ball. His size allows him to be affective on the boards and to pick up steals in the passing lane. He plays club ball for I-10 Celtics (ESP Bobcats) 2022 team. This year playing a national schedule he has proven to be a top 5 player in this class nationally. It is rare to see a kid at this age with the size at the point guard position. Ramel can also shoot the ball from deep and has the ability to score with contact in the paint. With his dad’s size and playing history, on top of playing under big time skill developer Julius von Hanzlik, Ramel Jr. future is promising to say the least.